The maker of a game set in a U.S. occupied by Korean troops said that controversy is good for the industry if it helps fuel debate. It may feel like Kaos Studios' president, Dave Votypka, may have a horse in this race but he honestly believes that controversy is a good thing for the industry. The game that his company is working on has had its fair share of attention, with most people focusing on the prospect of America being invaded and occupied by a unified Korean nation. Danny Bilson from THQ, who is publishing Homefront, even personally thanked Kim Jong Il for making the premise to this game more plausible. Votypka did say that it made a difference what kind of controversy your game is generating and whether it sparks a healthy debate. "I think it depends on the tone and depth of the controversy," Votypka said. "When you're dealing with portraying real events, with real people that the public currently has a personal and emotional attachment to, there are sensitivities there that need to be respected and avoided. But when creating speculative fiction, that is based decades in the future, it's just that, it's fiction." Obviously, getting talked about in mainstream media is good for product awareness, but you don't want it to be critical or inaccurate. If the result is a discussion of the fictional ideas and intellectual debate, that's fine and healthy. Frontlines was also built from a "what-if" scenario centered around peak oil, and the energy wars that could result when our finite supply of oil is no longer able to sustain our oil dependent existence. In that game, America and its Allies were fighting to control oil reserves in the Caspian Sea, which one could argue - and some have - that it paints America in a negative light; but it's a story! 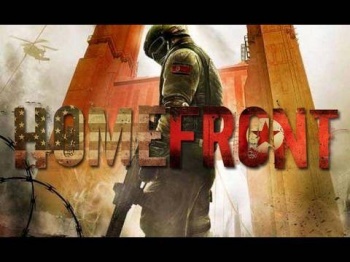 Votypka hopes that any possible controversy with Homefront gets a similar amount of press in order to present the ideas of the game, but he doesn't want it to go much further than that. He doesn't mention it, but its clear that Votypka would like to steer his game clear of the kind of controversy that Medal of Honor experienced with its inclusion of the Taliban and that ultimately might have hurt sales. On the other hand, the Hot Coffee brouhaha for GTA: San Andreas or the Russian Airport level of Modern Warfare 2 didn't do too much to hurt sales. In short, I agree with Votypka that controversial topics can be a healthy step forward for the game industry. We could sure use more compelling "games of ideas" like BioShock and perhaps Homefront. The trick is to make sure that the game is still fun.